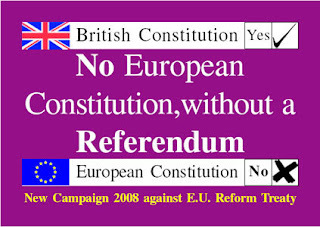 Campaign for a Referendum on Europe (CREC) has a web site linked here. The CREC suggest writing to a member of the House of Lords where the second reading of the EU Reform/Lisbon/Constitutional Treaty begins on April Fools Day, We, the people, are of course the fools in this deceitful process. Details of how to contact a Lord are linked here. (9) Finally, the Lisbon Treaty/Constitution gives power to European institutions to remove further powers from national Parliaments without their consent. Rumours abound that the above MP might join UKIP but in view of various allegations flying about this might be problematic for the party. I stood against Bob as Labour candidate in Castle Point in 2005 and with my LD counterpart exposed his "send them back" advert nationally. 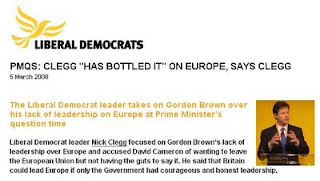 I deplore his views on Europe and immigration but would defend his personal integrity. He was threatened with deselection not because of his views on national issues but because he offended powerful local business interests in the building trade by opposing planning applications that were not in the interests of his constituents. He has made allegations of political corruption in Castle Point that chime with what local residents told me on the doorstep and need proper investigation by both the public authorities and the Tory Party. If this is verified then it would appear Dr Spink, in view of his voting record read here, would make a good candidate as UKIP's first representative in the Commons. The video from Google is linked here, Sean Gabb begins 19 minutes into the clip. I drove down to Exeter last Saturday the 8th March 2008, to speak at a United Kingdom Independence Party rally. If I had bothered checking in advance that the round journey would be 600 miles, I might have declined the invitation. I am glad, though, that I did not check, and that I did accept. Imagine, if you can, a party rally, put on by one of its regional branches, and attended by several hundred decent, ordinary people. Imagine, then, being able to watch a dozen or so people called to the podium to speak fluently and with passion about what they truly think. Imagine also being able to mingle throughout with the leaders and elected representatives of that party. Imagine all this, and you have UKIP. I watched parts of the Liberal Democrat conference on television yesterday. As with all the Regime Parties, these people talk about the need for commitment and fundamental change, and then carefully avoid saying or promising anything that might resemble either commitment or change. What I saw on Saturday with my own eyes was politics as it always used to be in England. the party and because I admire its leaders. I will not summarise my speech, as I made a video record of it, and of the one made by Marc-Henri Glendening of the Democracy Movement. There was some coordination between us, and so our speeches are worth watching one after the other. I am never happy with filming in a room where public address equipment is in use, but the sound quality is adequate. Our speeches are available courtesy of Google Video. Headline in today's IHT ...... really! Link here. The Telegraph mentions this today, here. The blog may be read by clicking here. A number of influential regional UKIP Chairmen (four) have e-mailed Party Chairman John Whittaker MEP, regarding the allegations against Nigel Farage MEP which appeared in the Sunday Times on 24th February. These have been denied by Mr Farage as was posted on the UKIP website. A retraction of the allegations by the Sunday Times is anxiously awaited by the Party, if none appears this Sunday, it would appear more serious difficulties for UKIP now lie ahead. What a tragedy that will be for all trying to resist the EU's onward authoritarian march! Petition the Queen to Reject the Lisbon Treaty! CLICK HERE FOR THE PETITION!